The establishment of cemeteries, such as the one pictured, may be prohibited by state or local legislative bodies but only under certain circumstances. Areas that are set aside by public authority or private persons for the burial of the dead. A public cemetery is open for use by the community at large while a private cemetery is used only by a small segment of a community or by a family. A cemetery includes not only the actual grave sites but also surrounding areas such as avenues, walks, and grounds. Cemeteries are not governed by laws that apply to real property or corporations due to their inherently different nature. Most states have established laws that specifically apply to cemeteries. The establishment of a cemetery involves the process of formally designating a tract of land for use for the burial of the dead. It must be set apart, marked, and distinguished from adjoining ground as a graveyard. The state, in the exercise of its Police Power, has the right to regulate the creation of cemeteries by providing for their establishment and discontinuance as well as to monitor their use. Private interests in the place of burial are subject to the control of public authorities, which have the right to require the disinterment of bodies if deemed necessary. Burial sites may not be absolutely prohibited by legislative action inasmuch as they are considered indispensable and directly related to the public health. Provisions in corporate charters cannot prevent the exercise of police powers with regard to which lands may be used for burial purposes, since burial in certain places might create a public Nuisance. Regulation by Municipal Corporations Subject to express legislative authority, and by virtue of its general police powers, a municipality may reasonably regulate places of burial within its borders. The key requirement is that a municipality may not act arbitrarily with regard to the regulations it adopts. The power of a municipality to regulate cemeteries is an ongoing one that may be exercised as required by considerations of public health and welfare. Regulations may prohibit such actions as future burials in existing cemeteries, the enlargement of existing cemeteries, or the establishment of new ones. A municipality may own and maintain a cemetery when it is expressly authorized to do so. General control may be exercised over a cemetery that a municipality owns, but control may not be exercised arbitrarily, capriciously, or unreasonably. Corporations and Associations A cemetery corporation, as defined expressly by statute, is any corporation formed for the burial of the dead in a receptacle or vault. Such a corporation may or may not be organized for pecuniary profit and may or may not be organized under the general corporate law. The members of a cemetery corporation are those people who own plots according to express statutory provisions. They cannot make a profit out of the sales of lots if the corporation is not for profit. Nor can they make a gift of their plot to another independent corporation. If statute permits, cemetery corporations may issue stock and pay dividends to stockholders. Stockholders may enact bylaws. Some statutes provide that a cemetery may give land shares, which are certificates entitling the holder to receive a portion of the profit from the subsequent sales of plots, in exchange for payment for the land purchased. This type of certificate is not a stock certificate but is in the nature of a nonnegotiable promise to pay money. The establishment of cemeteries may be prohibited by state or local legislative bodies, but only under certain circumstances. The interment of dead bodies is necessary and proper and therefore the prohibition of the establishment of a cemetery must be based on the potential danger to human life or health. State and municipal organizations are not permitted to prohibit burial for such reasons as the value of adjoining land being lessened or because a cemetery might be a source of annoyance to inhabitants of the surrounding community. Under some statutory provisions a cemetery cannot be established within a certain distance of a private residence, store, or other place of business without the owner's consent. Similarly, certain statutes provide that, prior to the establishment of a cemetery, consent must be obtained from the county or municipal authorities within whose limits the cemetery will be located. The purchaser of a plot in a cemetery is generally regarded as having obtained only a limited property right. He or she acquires a privilege, Easement, or license to make burials in the purchased plot, exclusive of all other people, provided that the land remains a cemetery. The plot owner's interest is a property right entitled to protection from invasion and the title is a legal estate. The owner's rights are subject to the police power of the state as well as the rules of the cemetery and any restrictions made in the contract of sale. A cemetery corporation may cancel the contract of sale of a plot where regulations of the corporation that are part of the contract are violated by the sale due to a Mistake of Fact.A purchaser may, in turn, rescind the contract where substantial misrepresentations have been made by the corporation. Plot holders cannot be prevented by cemetery owners from erecting markers, entering the grounds, or interring family members in the plots they own. If a plot owner dies intestate, the rights to the plot pass to the heirs in the same manner that Personal Property passes in the absence of a will. A gravestone or marker is the personal property of the person who places it near a grave and its ownership is passed to this person's heirs. Abandonment is the only way in which the use of land as a cemetery may cease. It takes place either by removal of all the interred bodies or by neglect to such a degree that the property is no longer identifiable as a cemetery. The removal of bodies may be ordered by public authorities when necessitated by the public health. The owner of a cemetery may opt to discontinue the sale of plots as initially planned, but permission to do so from government officials might be a prerequisite. The owner of a plot has the duty to care for and maintain the plot either personally or through an agent. A cemetery's trustees may supervise plots to prevent them from disintegrating to the point of unsightliness. If a statute so requires, a cemetery association must care for its plots. If a charter imposes a duty upon the association to keep the grounds in repair, this obligation does not encompass plots sold to individuals. A cemetery association has the duty to maintain the premises in a reasonably safe condition. Doing so includes the proper maintenance of portions of the cemetery used for travel or occupation by attendants of burials. Uniform and reasonable rules and regulations may be made for the care and management of lots by the proprietors of a cemetery. Such rules must be equal in their operation. An unreasonable rule would be to prohibit the owner of a lot from hiring his own caretaker; however, a rule requiring that such work be done by competent persons would be reasonable. Everyone is entitled to a decent burial in a suitable place. The right to be interred in a particular cemetery is an easement, license, or privilege. An element of this right is the privilege to be buried according to the usual custom in the community and pursuant to the rules and regulations set forth by the proprietor of the cemetery. When an individual does not purchase a plot subject to any restrictions on burial, the proprietors have no subsequent power to limit such right unreasonably. An individual who obtains the right to be buried in a cemetery subject to the control of a religious organization takes the plot subject to the organization's rules. This may limit the burial right to its members or to those in communion with such organizations. The church has exclusive jurisdiction over the question of whether a person is in communion with a religious organization and thereby entitled to burial in its cemetery. A Cause of Action may be based upon the interference with the rights of a plot owner. An unlawful and unwarranted interference with an individual's exercise of the right of burial in a cemetery lot is a tort. An infringement of the rights of a plot owner may be prevented by an Injunction if an injury is threatened. Either criminal or civil liability, or both, exist for Trespass or other types of injuries to a cemetery or to individual burial plots. If a burial ground or plot is wrongfully invaded or desecrated, an action of trespass may be brought against the wrongdoer. Vandalism and destruction of tombstones are criminal offenses. The person who erects a tombstone may maintain an action for injury to it. After that person's death, his or her heirs may prosecute such an action. Generally, the measure of damages for trespass is the cost of restoration. Since there is a strong public policy against injury to gravesites due to the indignity of the act, punitive damages—intended to deter future acts of desecration—may be awarded. Cronin, Xavier. 1996. Grave Exodus: Tending to Our Dead in the 21st Century. Fort Lee, NJ: Barricade. Echo-Hawk, Roger C., and Walter Echo-Hawk. 1996. Battlefields and Burial Grounds: The Indian Struggle to Protect Ancestral Graves in the United States. Minneapolis, Minn.: Lerner. Harnish, Jessica L. 2002. "Unlawful Concealment and Desecration of Burial Sites not Considered an Improvement to Land." University of Baltimore Journal of Environmental Law 9 (spring): 141–4. Mitford, Jessica. 1964. The American Way of Death. Greenwich, Conn.: Crest. Murray, Virginia H. 2000. "A 'Right' of the Dead and a Charge on the Quick: Criminal Laws Relating to Cemeteries, Burial Grounds and Human Remains." Journal of the Missouri Bar 56 (March-April): 115. Rezatto, Helen. 1980. 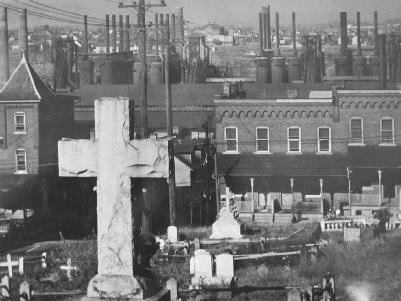 Mount Moriah: Kill a Man, Start a Cemetery: The Story of Deadwood's Boot Hill. Aberdeen, SD: North Plains Books & Art. Wright, Roberta H., and Wilbur B. Hughes. 1996. Lay Down Body: Living History in African American Cemeteries. Detroit: Visible Ink. Until now, including cemeteries on regular patrols was thought to be sufficient. Under the Rural Initiative plan, VA will build small National Veterans Burial Grounds within existing public or private cemeteries in rural areas where the unserved Veteran population is 25,000 or less within a 75-mile radius. Free candles, refreshments and snacks will be provided to the public at the said cemeteries. We say this is not acceptable as littering desecrates the cemeteries and disrespects the dead as well as the living, Vergara added. Daly said he has worked with a few groups that offered to turn their cemeteries over to municipalities. Unlike European cemeteries, where over time bodies are disinterred and cremated to save space, Forest Lawn and other American cemeteries have to plan ahead to make sure they have enough land to accommodate the dead. Adfa Chapel Cemetery, Powys, picked up a coveted cemetery of the year award for cemeteries 3. I urge everyone who witnesses acts of vandalism in any of the town's cemeteries to report details to the Bereavement Services Manager (Tel. Sian Hooper, of Bridgend council's cemetery department, said: ``A great deal of effort is put into keeping the cemeteries looking their best and the hurt felt by relatives when graves are desecrated cannot be described. Cataraqui Cemetery is among the first rural cemeteries established in Canada. the 1-mile and 5K courses lace through historic Metairie Cemetery, one of the most famous & historic cemeteries of the South. The MMDA personnel to be deployed for clearing operations in various cemeteries in Metro Manila will come from the flood control, emergency response and cleaning units.